Denon DRA-100 Network Music System. Available with Online Finance and Free Delivery. The elegant DRA-100 Network Amplifier. 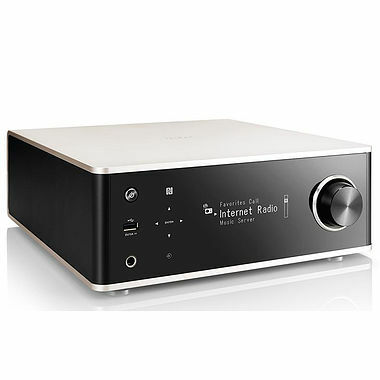 Sporting a sleek aluminium body and two-tone design, its boasts a 2x 70W digital amplifier with Advanced AL32 Processing, network streaming capabilities, gapless playback and, of course high resolution audio. For the most convenient music streaming from Apple iDevices, the DRA-100 comes with built-in AirPlay technology. Also, an OLED, a USB-A connection, two optical and one coaxial input and Spotify Connect are present and correct.